Think of Mexico and a wealth of images spring to mind. One of these is the masked wrestlers who have become immensely popular social and cultural as well as sporting icons. There’s a mystery and magic to the world of Mexican wrestling that distinguishes it from the over-theatrical glitz and false bravado of American professional wrestling. Behind the mask, the wrestlers have ordinary lives, of course, and these have been captured in a superb collection of photographs assembled by acclaimed Mexican photographer Lourdes Grobet over 30 years. 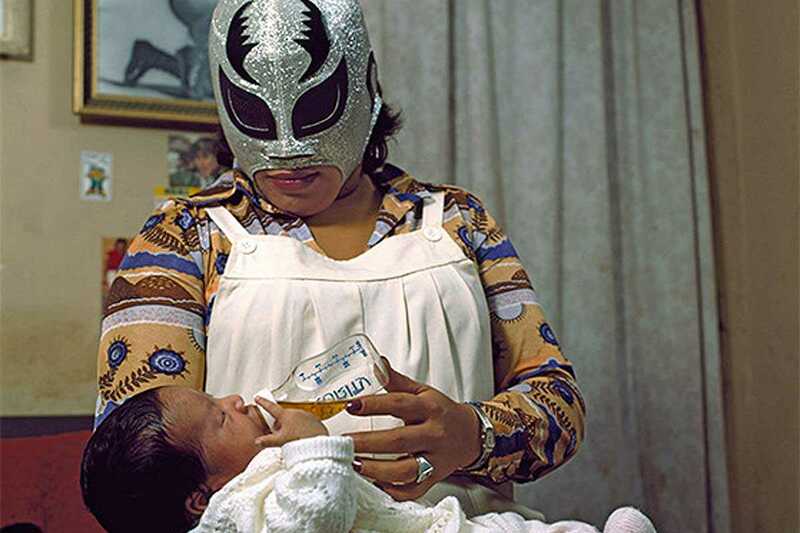 Mexican Lucha Libre Wresting: Family Portraits reflects the home and family lives of these wrestlers, male and female, when they are away from the ring. Opening on September 22nd at 7:30pm at the CCCB, Grobet’s exhibition includes over 40 large-format photographs, often with a delicate humor, alongside supporting material. The opening also represents the start of the MXaBCN Festival of Mexico.